By Todd GardnerThe Long Road to Settlement The reef basses, Liopropoma sp. are a group of small groupers found on tropical coral reefs throughout the world. Like other members of the family serranidae, they are hardy, disease resistant, and uninterested in eating most reef invertebrates; however, unlike many other serranids, they remain small, are brightly colored, and are nonaggressive. This appealing combination of traits undoubtedly is the reason for their popularity in the marine aquarium trade. I was first introduced to this genus while working for C-quest in Puerto Rico in the 1990s. 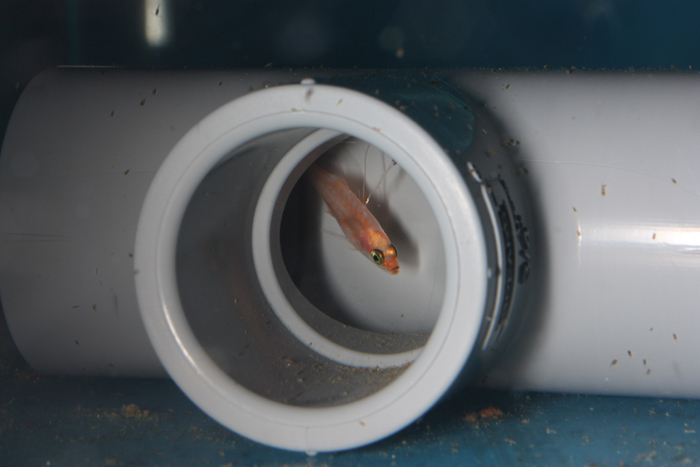 Although most of our 1600-tank broodstock room was devoted to anemonefishes, gobies, and dottybacks, a small section was set aside for species that needed some R&D in order to get into production. It included pygmy angels, dragonets, damselfishes, basslets and a few others. When time, space, and live food availability permitted, I had opportunities to work with some of these fishes. There were three species of Liopropoma in this section: L. rubre, the swissguard bass, L. eukrines, the wrasse bass, and L. carmabi, the candy bass. They didn’t actually grab my attention at first (keep in mind that I was suddenly working around a dizzying array of fish species) however, once I had my first look at their larvae, I was captivated. It became a mission of mine to raise some of these fish. Like all serranids, the Liopropoma are hermaphrodites, so pairing them was easy and all pairs spawned on a regular basis. Although each pair produced an impressive number of eggs over the course of a month, they only produced a relatively small number at a time (less than 100 each night for a few nights in a row, followed by a resting period). Small spawn size presents a problem in larval rearing in that, whereas most larvae benefit from a large rearing tank, food densities need to be kept high enough for larvae to find something to eat. Add to that the fact that live food organisms tend to reproduce in the rearing tank and you have a situation where food levels can easily get out of control. It also helps to have all of the food in the tank consumed in a short period so that it can be replaced with new, enriched food organisms. It didn’t take long for me to figure out that this would never be possible with Liopropoma larvae unless I had an unrealistically large broodstock. During my three years at C-quest, I had maybe a dozen opportunities to work with these larvae. 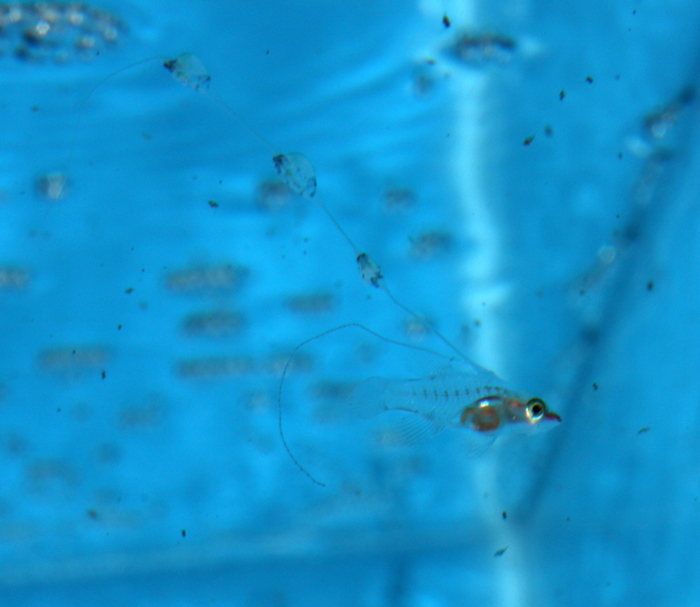 We collected the pelagic eggs in a 120-micron Nitex bag attached to the overflow of each tank. The bottom of the bag rested in a small container of water so that the eggs would remain immersed. In the morning we would rinse the eggs into a beaker and lightly aerate them for the rest of the day, then pour the partly-hatched eggs into a rearing tank, which was usually a 300-gallon round polyethylene container. 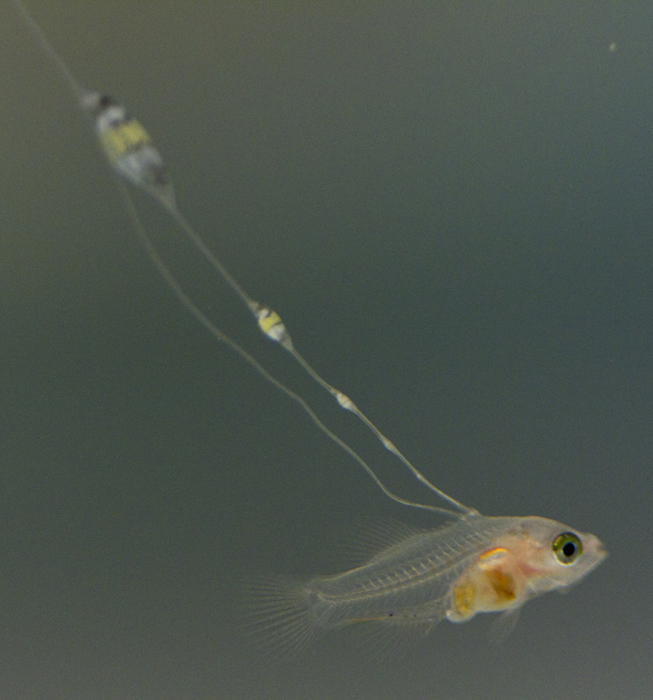 The non-feeding prolarval stage lasts 4-5 days, during which time the tiny, laterally-compressed fish becomes slightly more elongate and begins to develop a dorsal filament that appears to be an extension of one of its dorsal spines. Within a few days, this filament becomes heavily pigmented and grows to several times the body length. When the larvae are ready for first feeding, they can be seen actively searching for prey with the dorsal filament trailing behind, acting almost like a rudder, keeping them facing into a current. A close-up of a pigmented dorsal filament sac. 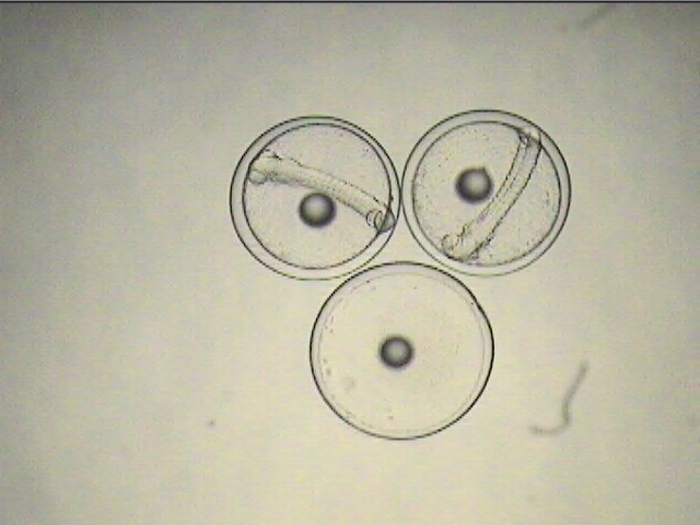 At C-quest we only had two live foods in regular production: Artemia and rotifers. After hatching my first batch of Liopropoma larvae, it was obvious to me that neither of these foods would be small enough for them. At times our rotifers would become contaminated with small ciliated or flagellated protists. Using sieves, I could usually separate them from the rotifers, but they always seemed to be too small or they moved too fast and the larvae never showed any interest in them. On two occasions however, a contaminant appeared in our tanks that showed some promise. 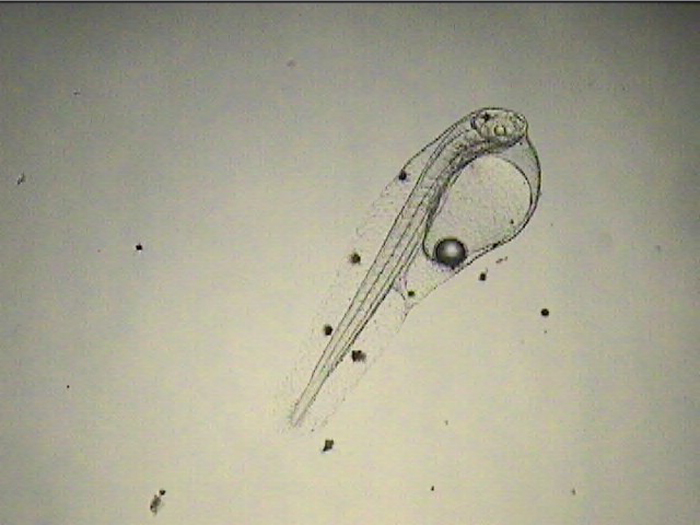 The first one was a copepod (probably Acartia tonsa) that appeared in some of our rotifer and larval rearing tanks and eventually became an important part of our early success with Pseudochromis sp. (for more on that, check out FAMA January, 1999: A Welcome Contaminant). Although the adult copepods were far too large for the larvae, I could inoculate a rearing tank with them and if the timing was right, they would reproduce and there would be copepod nauplii available when they were ready to eat. The second one was a ciliate that bloomed up in an outdoor tank. At the suggestion of Bill Addison, I pulled up some weeds and grass from the property and soaked them in a tank of seawater out in the sun for a few days. The idea was to induce a bloom of some kind of protist from the combination of seawater and decomposing vegetation (what fresh-water breeders call infusoria). On one occasion, something interesting did bloom up. It was a ciliate that was a little larger and slower than the typical rotifer tank contaminants. It was about half the size of a rotifer and swam slowly enough that a larva may have a chance to catch it. In addition to the size and speed, it also had another appealing characteristic. It had a crown of cilia at the anterior end, as many ciliates do, but at the posterior end it had several thicker appendages – fused cilia, that remained in a bent position while at rest, but could be used to “kick” the ciliate ahead in a pulsing motion that almost reminded me of the movement of a copepod. 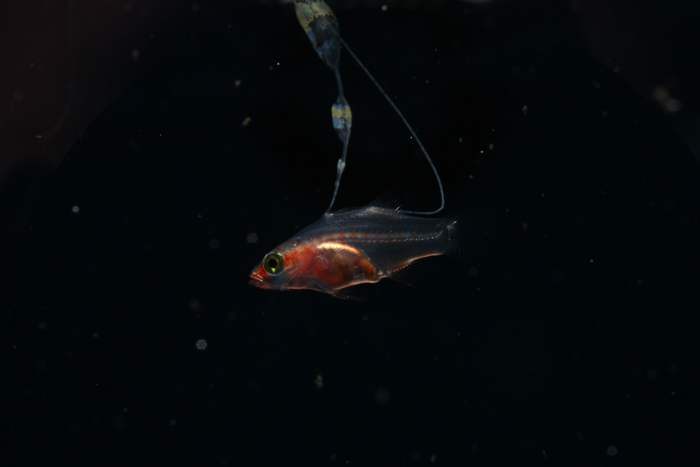 I was very excited about this particular characteristic because I knew that for many fish species, it seemed to be the swimming motion of copepods that elicited the feeding response. It was pretty rare to have everything come together at once that would allow me to get some Liopropoma larvae past the point of first feeding: a good haul of eggs, good numbers of this new ciliate or perfect timing of an Acartia hatch-out, a free rearing tank, and the time to spare in my busy schedule of raising dottybacks and gobies. This perfect storm of conditions came together only a handful of times for me at C-quest and on two occasions, once using the ciliate, and once using the Acartia, I was able to get some Liopropoma larvae to 15 days post-hatch. I had no idea how long their larval period lasted, but based on my experience with other species, one month seemed like it might be a reasonable guess, so I was hopeful that I may have gotten halfway there. A couple of years later, as a graduate student at Hofstra University, I obtained a single pair of Liopropoma rubre for a broodstock system of assorted species I was assembling to help keep me occupied between classes and working on my thesis. Sadly, by the time this pair started spawning, it was time for me to graduate, so I donated it and several other pairs to my friends at the New York Aquarium. Since beginning work at the Long Island Aquarium in 2002, I have been slowly amassing a new broodstock of assorted species while cramming aquaculture tanks into every available space I can find behind the scenes (for more on that, check out: http://www.reefsmagazine.com/forum/r…ine-world.html). In 2004, I was blessed with another appearance of Acartia sp. in one of my rearing tanks and I have continued to keep it in culture ever since. More recently I began to notice an interesting looking ciliate invading my rotifer tanks on a regular basis, a sight that should be cause for concern, but microscopic examination revealed that it was the same as, or very similar to, the kicking ciliate from C-quest. Needless to say, I was happy to see it, especially since I had numerous new tools at my disposal to help me identify it. When this organism first appeared in my life, it was impossible to identify anything since Google didn’t exist yet. The ciliate apparently belongs to the genus Uronychia. At this point, that’s all I know about it, but I hope it will prove to be useful in getting new fish species into production. By 2009, I decided it was time to revisit the Liopropoma and fulfill my dream of raising this amazing larva through settlement. So I began to purchase swiss guards (L. rubre) from some of our local dealers. Then in a generous show of support for my research, Forrest Young of Dynasty Marine Enterprises and Jonathan Hale of Country Critters Pet Shop in Patchogue, NY, donated a total of six candy bass (L. carmabi) which were easily turned into three mated pairs. As if I didn’t already have enough encouragement to get this project off the ground, several new live foods have become available in the last two years that promise to revolutionize marine fish culture. Eric Stenn sent me a culture of Pseudodiaptomus pelagicus, one of six species of copepods now sold by his company, Algagen. Reed Mariculture, another leader in plankton products have added Parvocalanus crassirostris, a small calanoid copepod to their product list and were nice enough to send me some. Including my Acartia species, I now had three different copepods to work with. I purchased some black polyethylene, conical bottom containers from Polytank, inc. to use as rearing tanks and I began to assemble something of a system. The tanks ranged in size from 15 to 90 gallons, but I found that the 55-gallon version was easiest to manage for larval culture. One major obstacle to completing my rearing system was that there was no reasonable place for me to fit a sump. I was anxious to get started though, especially since my L. rubre were starting to spawn regularly, and I decided to just start using the tanks in place. I would try to maintain water quality through phytoplankton (greenwater) additions and water changes. Water changes were accomplished by dripping sterilized seawater into the tanks. An expanded 120-micron screen on the top of the standpipe helped to keep the larvae and some of the food in the tank. On my first attempt, I managed to break my former record from more than ten years earlier and got a single larva to the impressive age of 17 days post hatch. In the months that followed I chipped away at that record, getting larvae to 46 and then 49 days (so much for a one-month larval period) before finally getting a few to settle. The following is a summary of the systems and techniques involved. Broodstock and egg collection The Liopropoma broodstock system consists of six standard 29-gallon tanks, painted black on three sides. The tanks have no substrate, just a 1 ½ inch PVC -T fitting for shelter. A 60-gallon sump with fluidized bio balls kept in motion with a Hydor Korallia prop unit is the primary biological filtration. Two Phos Ban reactors from Two Little Fishies with fluidized aragonite (rather than Phos Ban) provide some additional biological filtration as well as some buffering. A Little Giant 5-MD pump circulates water between the sump and tanks with a bypass loop for the reactors. A 40-watt UV sterilizer is plumbed into the main circulation loop. I siphon detritus from the bottom of each tank daily. The broodstock is fed 4 times a day with a gel-based diet (from Mazuri) containing a variety of fresh seafood (whatever is available), frozen marine mysid shrimp, and Fauna Marin soft shrimp pellets. I started out collecting eggs the same way we did at C-quest – in a mesh bag attached to the overflow pipe, but in an attempt to increase egg viability, which was only around 10%, I fitted the bulkhead screens on the outflow with 500-micron mesh. This keeps the eggs in place against the screen rather than allowing them to tumble in the sac overnight. In the morning I pull out the egg-covered screens and swirl them into a beaker of sterilized seawater and allow them to settle for about 30 minutes. 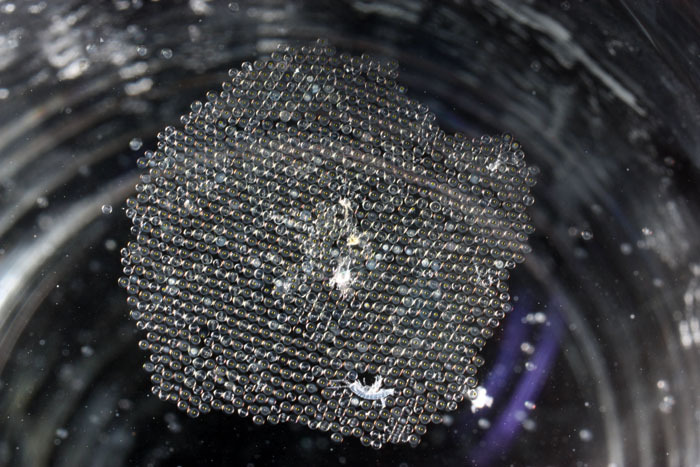 The eggs that float to the surface are viable and are removed with a pipette and placed in a 2-liter cylinder of sterilized seawater under gentle aeration. The egg viability rate is still pretty low and I am working to find the right disinfection regime. So far I have experimented with formalin, erythromycin, Nolvasan, methylene blue, and nitrofurazone. To date, erythromycin in the settling jar seems to work best. Spawning is centered around seasonal and monthly cycles with maximum egg production and viability taking place between July and November and in the few days around the full moon and new moon. Larval rearing Newly-hatched prolarvae are placed into a 55-gallon cylindrical tank with UV-sterilized seawater and gentle aeration. After 2-3 days a combination of adult copepods is added to the tank. I don’t measure, but simply scoop a couple of liters out of each copepod culture tank and pour them into the rearing tank. At this point I also add a 50/50 mixture of Isochrysisand Nannochloropsis to darken the water and feed the copepods. Although I have usedUronychia in a few trials and they do eat it, I have not been able to successfully isolate it from my rotifer cultures. Therefore I am reluctant to use it as rotifers can easily overwhelm a lightly-stocked rearing tank. Since my space for copepod culture is very limited, I use the same tanks for the culture of larvae and copepods. When I don’t have eggs to work with, all tanks are devoted to copepod culture and if a batch of larvae fails, I often just let the copepods bloom up. 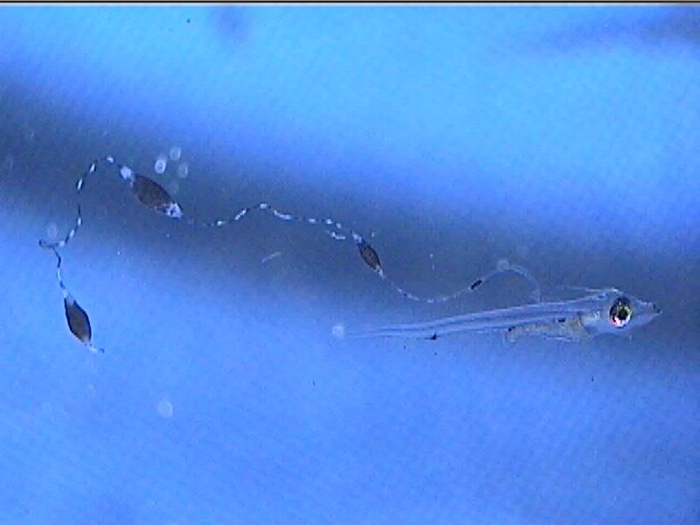 On the rare instance where I get a great hatch of eggs that are timed perfectly with egg-carrying adult copepods ready for a hatch-out at the point of first feeding, getting good numbers of larvae through the first month is actually pretty easy – providing I can keep the copepod numbers in control. I accomplish this by turning up the flow from the water change/drip line slightly and swapping out the 120-micron mesh on the standpipe with a 500-micron mesh as soon as the larvae are large enough to resist it (around 3 weeks). Once I started getting larvae past the two-week mark regularly, several new and remarkable features of their development were revealed. The dorsal filament, which can grow to 20 times the body length (or longer) develops a series of sacs that seem to play a role in buoyancy and stabilization. 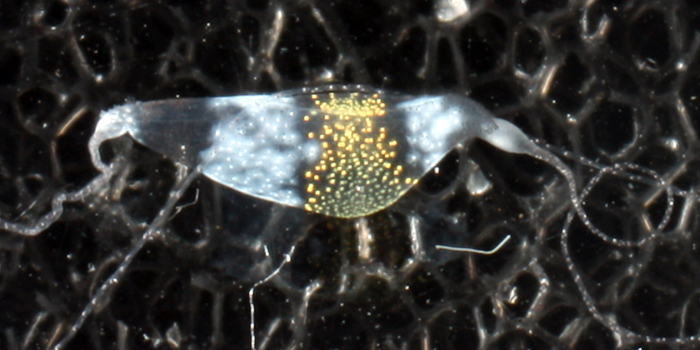 The sacs become heavily pigmented with black, white, and yellow chromatophores. Additionally, between 17 and 25 days post hatch, a second thinner filament forms behind the first one. Except in a few rare cases, the second filament does not develop sacs; however it can grow at least as long as the first one. Considering the size of the filaments, it’s hard to imagine that the buoyancy benefit gained from the filaments and sacs justifies the energy expended on their production. This has led to much speculation about alternative functions. Mimicry is one possibility. 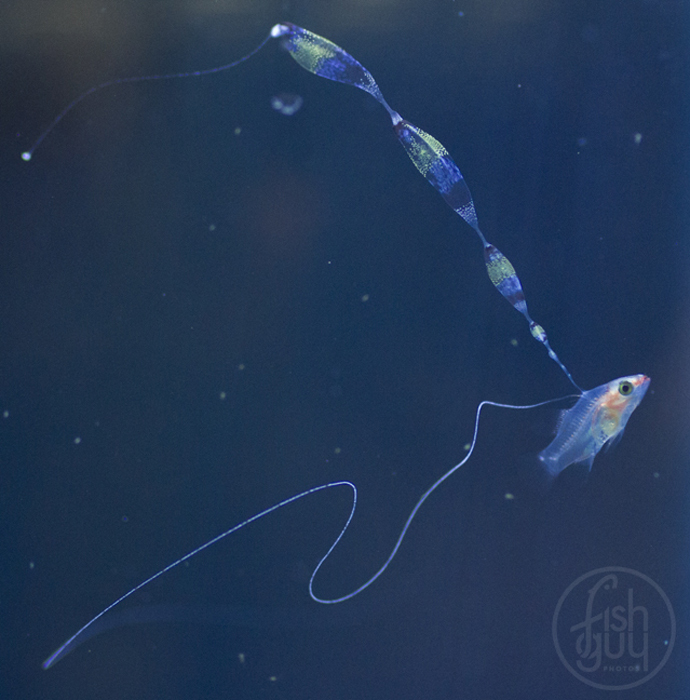 In younger larvae, the spotted filament resembles the stinging tentacle of a siphonophore or some other pelagic coelenterate. In older larvae the sacs are proportionally much larger and, viewed from certain angles, look like larval fish themselves. The black pigment on the anterior end looks like a pair of eyes from above, and the yellow pigment near the center is placed right around where the visceral cavity would be visible through a transparent larva. The resulting look is that of a line of larvae swimming through the water, so perhaps they also serve as decoys to predators of ichthyoplankton. During the summer of 2011, after losing a few strong looking batches of larvae past the 30-day mark, I decided to address my suspicions of bacterial blooms as the cause of mortality. Although I was very tempted to try antibiotics, I resisted the urge so as not develop a technique that was dependent on them. Of course I was also thinking of the development of resistant strains down the road. On the advice of Martin Moe, I carefully scooped one-month-old larvae out, one at a time and placed them into a new, clean tank – in this case, a 250-gallon polyethylene container that we salvaged from an old protein skimmer. The larvae showed their appreciation by not dying. I was definitely on to something. Unfortunately, I still hadn’t gotten around to finding a place for a sump and finishing my rearing system, so the amount of water I could flush through the tank was limited by the rate at which I could filter and sterilize enough seawater to keep a drip line going in all my copepod and rearing tanks. I estimated that it would take around a week to turn over the water volume of this new tank at the rate I was dripping water in. On a side note, I decided to take advantage of the plankton-rich water flowing out of my culture tanks by directing it into the sump of my non-photosynthetic reef system in order to provide continuous food dosing to the filter-feeding invertebrates in there. Settlement After another three weeks I started to see some mortality in these, now 50-day-old larvae and I decided to risk moving them into a glass tank on my clownfish broodstock system. They were very bass shaped, so I hoped that settlement was imminent, although their filaments were longer than ever. One larva had 11 sacs on its dorsal filament (a record number!). I very carefully scooped out one larva at a time in a 1-liter plastic container, carried them downstairs, and placed them in the 20-gallon tank with a trickle of water flowing through from the system. On the first day I tried this with seven larvae. A few of them were very stressed by the move and four of the seven were dead the next morning. Although I knew I would lose more in the process, I chose to continue moving them as I also knew that conditions were deteriorating in the rearing tank. Over the next few days I moved several more, with some mortality in the process. I ended up with nine surviving individuals split between two 20-gallon tanks. This gave me my first opportunity to get a really good look at these advanced-stage larvae. It also gave us some great photo opportunities. My fellow aquarist, Chris Paparo came to be the official photographer of the project as he has better equipment and more photography experience than I do, and we were both thrilled at the chance to get our cameras so close to these guys for the first time. During this period, it was extremely stressful coming in and checking the tanks each morning, hoping that there would still be fish swimming around; but it was equally exciting because we knew that any day we might find one or more of the larvae settled out. To add to the excitement we weren’t sure which species we had because around the time the eggs from this particular batch were hatched (late August), my L. carmabi had started spawning. So my daily egg collections included eggs from both L. rubre and the more expensive and brightly colored L. carmabi. I knew that the odds were in favor of L. rubre because those pairs were older and were producing larger spawns, and also because of the general rule in aquaculture that prettier, more expensive species are more difficult to raise. Still, the possibility was there so the dream lived on until the last larva settled. Except for one little problem: Once the larvae were settled, I still couldn’t tell which species they were. In many species, there is a well-defined metamorphosis – a period of rapid change in which the fish settles out from the plankton, takes on the coloration of a juvenile, and begins behaving differently, almost overnight. Apparently this is not the case with Liopropoma development. 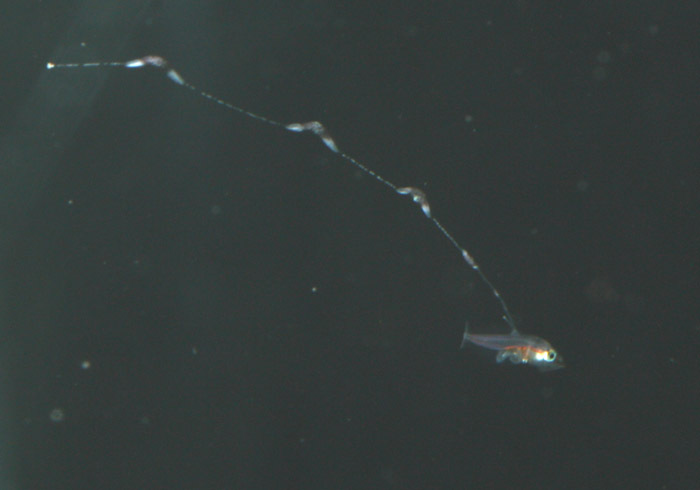 The first larva settled out at 69 days post hatch, but the only coloration was a slight pinkish hue and it took more than another month for it to completely lose its dorsal filaments. In all, nine larvae ended up settling, but soon after, several of them became re-suspended and started drifting as larvae again. Two of those eventually re-settled, but their abdomens began to swell from what looked like a bacterial infection and they died a few days later. The rest of the re-suspended larvae slowly wasted away and died over the next week or so. That left just four post larvae that settled between days 69 and 80. 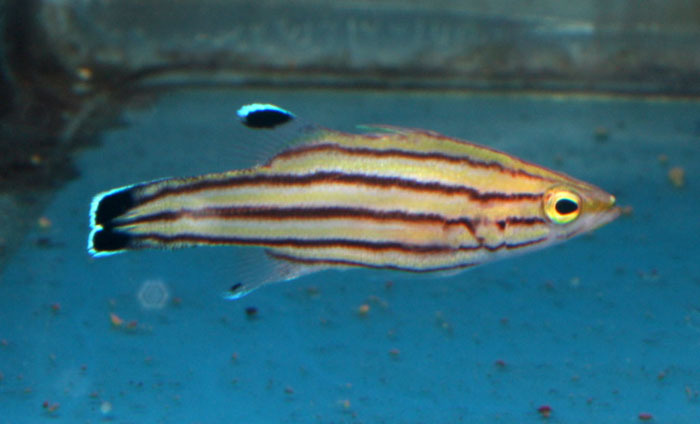 At day 85, one juvenile showed the first hint of striping, but it was still several more weeks before it had enough coloration to determine that it was L. rubre and before the others developed stripes. The last one didn’t get its stripes until day 120. During this early juvenile period, I began to wean them from adult Pseudodiaptomus to live juvenile mysid shrimp. This process was almost as long and painful as their metamorphosis. 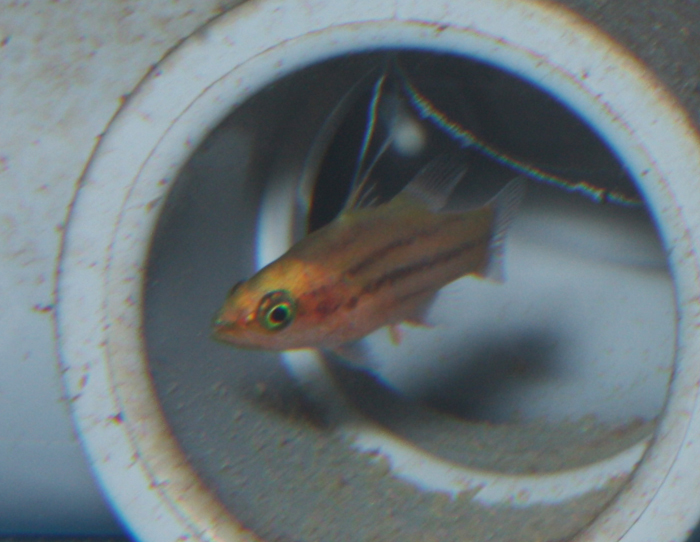 Now, more than six months after hatching, the four small juvenile swissguard bass look like they might be getting close to what I would consider market size and they are eating frozen mysids and Cyclop-eeze. Although it would probably make good sense to get the genes of these survivors back into my broodstock as soon as possible, I also think it’s important to get new species into the trade. So as soon as I feel they are large enough to make the trip, I’ll be sending them down to Dynasty Marine so that Forrest can get the world’s first captive bred Liopropoma onto his availability list. Epilogue Since December I have been collecting eggs only from the three pairs of [B] L. carmabi and applying the same techniques described above. They are currently in the spawning “off season” (still producing a few eggs but almost no viability), however there are currently three 95-day-old larvae that I moved into a glass tank last week and another 20 or so at 30 days post hatch still in a rearing tank. So far it appears that L. carmabi grows more slowly and has a longer larval period than L. rubre, however my lack of control over temperature and other environmental factors makes it impossible to determine the cause for this disparity for now. Obviously the Liopropoma are still a long way from commercial viability, but I hope that this preliminary success will help to pave the way for more widespread breeding of these beautiful fishes. Stay tuned to Reefs.com for further updates on my work with these and other species.